This map shows an approximate division between the three known nesting territories. The light green areas indicate woodland. The darker areas indicate where large numbers of trees were lost in the storms of late 2006 - generally known as blow-down. 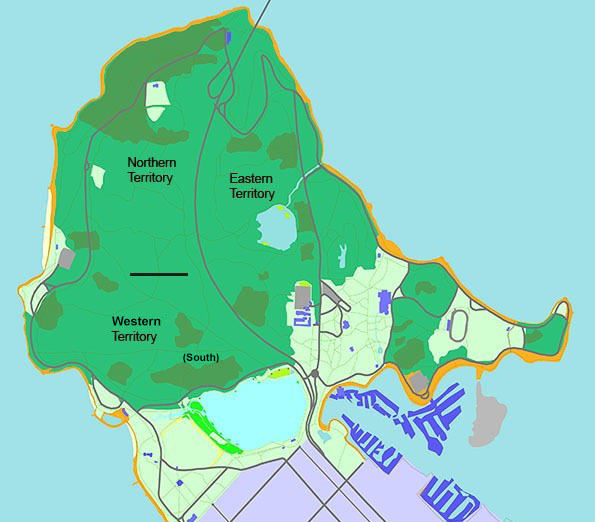 Thanks to Peter Woods (Stanley Park Explorer) for the underlying map. Conventional wisdom has it that there is only sufficient space for one breeding pair of Barred Owls within Stanley Park. However, over time we have discovered that most years there are three pairs actively nesting. No doubt the reason that the park can support so many owls comes down to food supply. Being a somewhat urban park it has a large supply of squirrels, rodents and small birds - supported, in part, by human activities (some deliberate, some not). The division between North and West (South) is somewhat variable - based initially upon an encounter with multiple owls near the line indicated. It was clearly one family with young and probably two other adults. Naturally the border will vary from year to year. Since this map was created the Western territory has split (briefly) into Southern and Western. However, that only lasted one year (2009). See the Statistics page for more details. We finally determined that there must be 3 pairs based upon sightings of the young. It helped that each family usually had a different number of young (1 to 3) and that there were sightings by different people at the same time (of the young). Full confirmation came for North and South in 2008 when I actually located nest sites and even saw one owlet take its first flight! Once I have fully reviewed my rather sketchy records for the last ten years or so I will be able to supply more information on the sites and general distribution of owls. Copyright (c) 2009-2018, Mark T. White. All Rights Reserved.